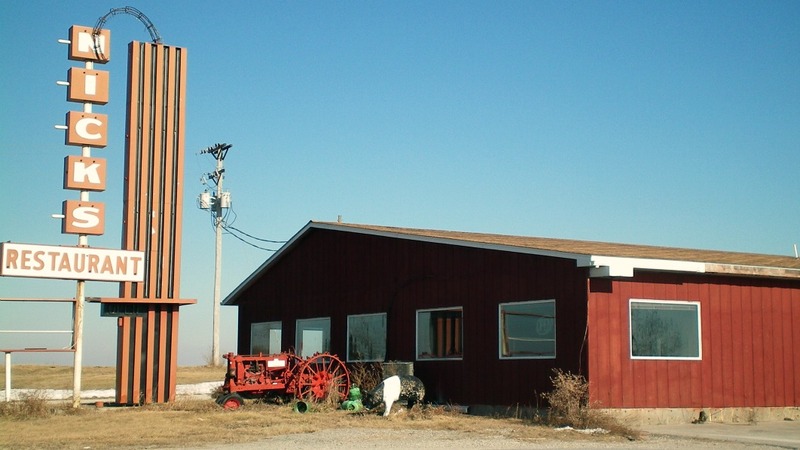 I had driven past Farmer Nick's Restaurant a few times over the years because I could have sworn the place looked closed. 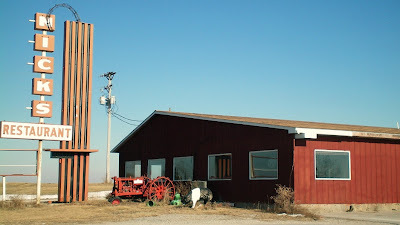 There are rusted old tractors and an out of use gas station connected to the building, along with an archaic satellite dish right in front. The dirt parking are had some semi-trucks and upon getting closer I saw some traffic inside. 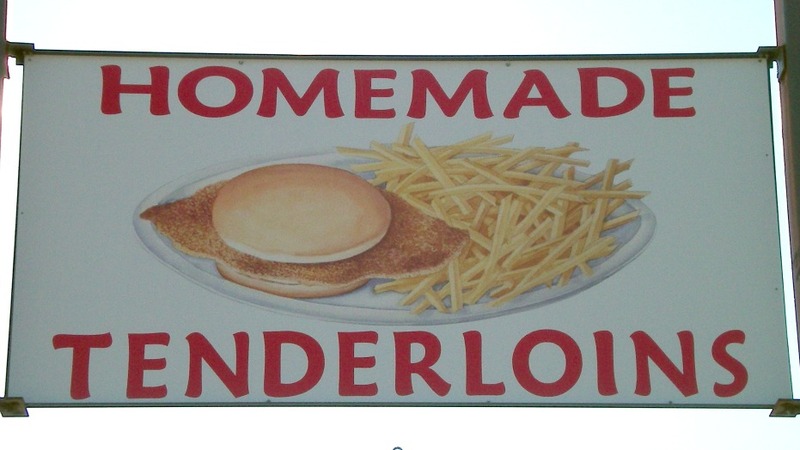 It turns out the sign reading "Homemade Tenderloins" faces north, away from the Interstate. Location: The address is in Brooklyn but its really in between Victor, Guernsey, and Brooklyn in Poweshiek County, Eastern Iowa. Directions: Get off I-80 at exit 201 and drive north a short distance on Highway 21 to see this place. 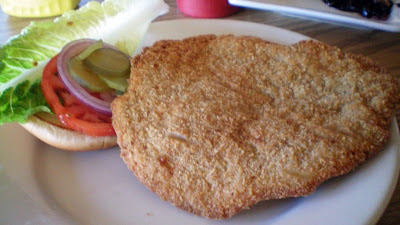 The Tenderloin: This had the usual triangle shaped pork loin cut. The meat was cut thin but was soft to the touch. The cracker meal made a small layer of crunch. Served with lettuce, tomato, onion, on a toasted bun. This was an alright homemade tenderloin, overall 7.5 out of ten. 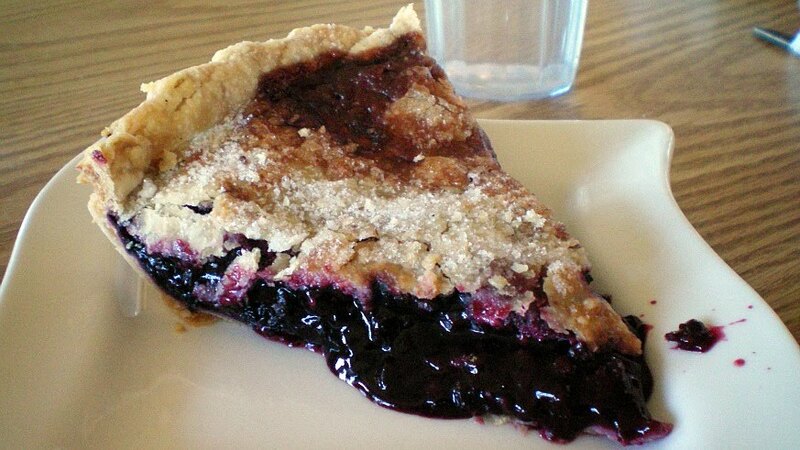 Price: $5.50, also available in a dinner with two sides or smothered with gravy along with mashed potatos. 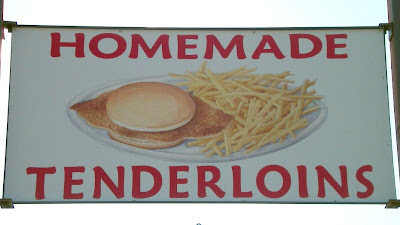 Also on the menu: Its comfort food all the way through with burgers, the usual fried stuff, and a Czech Burger described as a pork patty topped with melted cheese. The menu lists a locally grown Buffalo Burger. Service: Its table service with a couple attentive waitresses running around constantly. Ambiance: The marked "Entrance" is in the back, you have to walk through a room filled with old farm furniture and other stuff for sale. The dining area has some vintage and funky fixtures to sit at. The decorations are just random, like sports trophies from 1994, or stacks of pizza boxes and a line of Beer Steins. They don't even serve pizza or beer if I remember correctly. Final Thoughts: This place certainly is popular with the locals, as it was nearly full on the Tuesday I stopped by. Since Brooklyn 80 Diner had closed I hadn't found a good place to eat along this part of I-80. I think I will get one of the daily specials next time I stop in here. Go two exits west of this one & get off in Malcom. The Pour House has the best tenderloin around!!! 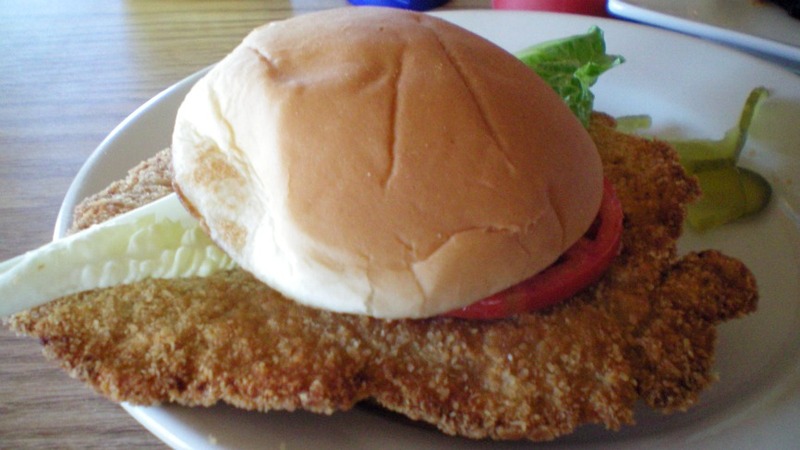 hi my name is Ralph and all these sandwiches are nice "BUT" I will have you to no that I personally make the WORLDS GREATEST PORK TENDERLOIN SANDWICH and I would challenge anyone out there to prove me wrong !!!! please feel free to contact me if you would dare try this CHALLENGE !!! I look forward to a response from a worthy opponent! Ralph Cory rdc@iowatelecom.net or call 515 205 8574 Iam "The Grill Sergeant"